Posted on September 4, 2018 by Kelly M.
Thank you to John, Andrew, and Sarah for working on Labor Day, pre-harvesting peppers and beans in preparation for today’s big restaurant run (the team is still loading the truck as I write this with 16 stops to make before the day is done!). And thanks to the rest of the team for working late on Friday to finish the harvest in advance of Saturday’s market—one of the most successful since 2005! A special thanks to CSA work share Nancy Allen who helped me cut sunflowers in near total darkness. The low light helped us appreciate what’s so great about a variety of sunflowers called Sunfill—they’re meant to be green! Now that vacations are ending, people are back in town and apparently hungry for fresh produce! If this describes you, know that we have all the summer favorites at the stand today—watermelons, cantaloupe, and tomatoes. We’ll have the melons for only a few more days, so come and get them! If you’ve been shopping at the stand on weekends, you’ve probably run into one of our three regular stand volunteers: Caroline Cook, Linda Conrad, and Elizabeth Kloss. They do great work restocking the display, sharing cooking tips, and making it a pleasure to shop there. Thanks all for your consistent help at the stand! Tomorrow is the last summer CSA distribution of the season. The following Wednesday marks the start of our fall CSA program. It’s not too late to sign up for the fall CSA, and we’ve re-designed the program so that members now receive late summer crops such as tomatoes and peppers, as well as the fall staples: winter squash, potatoes, onions, Brussels sprouts, and more. 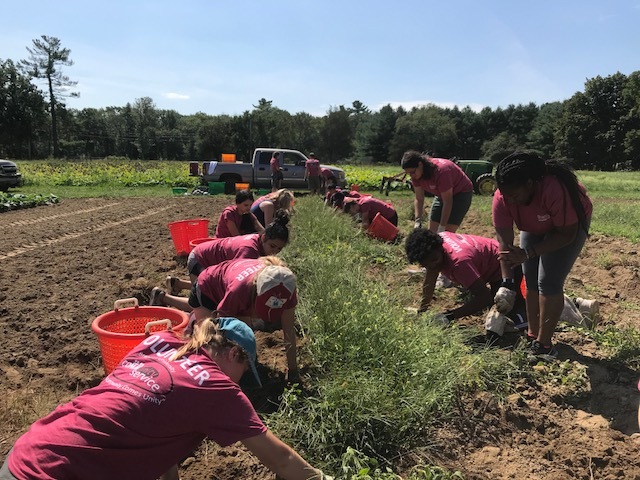 We’ll soon turn our attention to bringing in the winter squash, but over the weekend, incoming freshmen from Brandeis University helped us pick string beans, tomatoes, and potatoes, while also doing some weeding. Students from as far away as China, San Diego, Chicago and Atlanta, loved harvesting, grumbled about weeding (that’s normal! ), and all in all gave us some much needed help. Thank you! 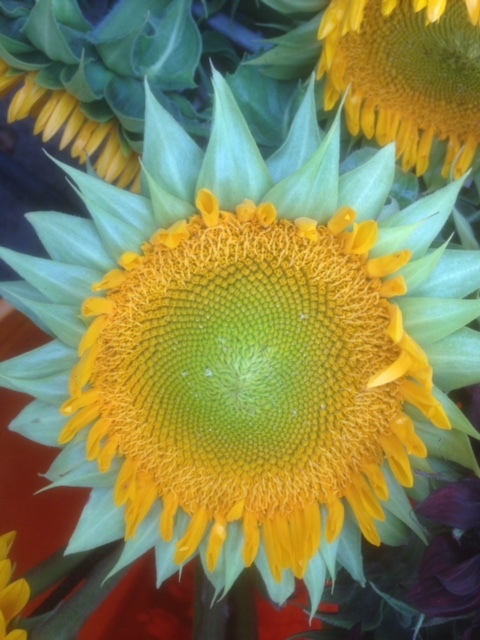 This entry was posted in Farming and tagged crops update, csa, fall csa, sunflowers, volunteering, weeding on September 4, 2018 by Kelly M..